UNITED NATIONS, October 28 -- When the UN's Special Adviser on the Prevention of Genocide hosts an event about “Dangerous Speech on the Road to Genocide,” it seems fair to ask about Sudan, the only country subject to an indictment for genocide by the International Criminal Court -- especially with the Adviser is from Sudan, and the UN helps produce and sell his books about Sudan. 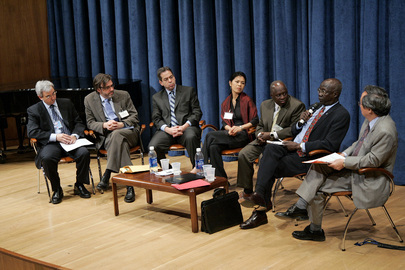 But when Inner City Press asked Francis Deng and his co-presenter Dr. Susan Benesch for this opinions of genocide and Sudan, and the place of media strategies in this, the UN's Deng refused to comment, and instead deferred to the Ambassador of Sudan, Dafaala Al Haj Ali Osman, who ridiculed the ICC's genocide charge by only partially quoting the definition of genocide. 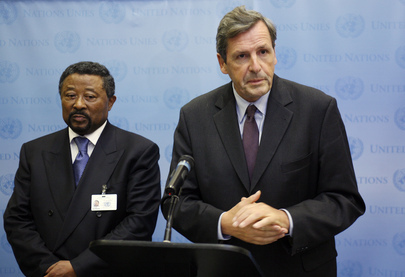 Neither Deng nor Dr. Benesch offered any response to Sudan, including the misquoting of the Genocide Convention. But Deng in turn deferred, to the representative of the very government accused of genocide. Deng said, “I think we should restrict our questions and comments on the subject of today's lecture.” Video here, from Minute 57:08. Since the event was about genocide and media, a question about genocide and the Sudanese media seemed well within the subject. Inner City Press emphasized this, so that Deng couldn't use fairness as a basis for not answering noting the presence of Sudan's Ambassador in the room. “So ask him,” Deng said. Video here, from Minute 57:08. Inner City Press: This is also on Sudan, but it’s sort of on the UN. There was an event yesterday held by DPI [Department of Public Information] in the North Lawn Building called Event, New Vision, it was about Sudan and it had Mr. [Francis] Deng speaking at some length about books that he has written. It had books for sale outside the room and had the host, the Ambassador of Sudan. But what had led me to wonder is, I know Mr. Deng is the Special [Adviser] on prevention of genocide, but it seems… I’ve heard from people that these books are written on UN time; that this is actually one of the things that he does in his UN office. And so, I just, I am unclear of what to make of the book, of the books that he produces. If they are created on UN time and with UN money, are they UN views or is there some, what are topics is his office working on in terms of…? Spokesperson Nesirky: Did you attend it yesterday? Inner City Press: I did attend it. Spokesperson: And you asked him? Inner City Press: And I asked him afterwards what other countries he is working on prevention of genocide; he said, “We don’t like to be country-specific.” But it seems like it’s hard to prevent genocide unless you name countries. Spokesperson: Well, this is obviously something that Mr. Deng can comment on. I don’t have anything on that. Inner City Press: What are rules, I guess I am saying, for UN, if a UN official spends his time in the UN building while on UN time writing books? Does the UN own the copyright? Spokesperson: That’s what you are saying. Or you said, “Some people say”. That is not an established fact, Matthew. You shouldn’t then turn it into an established fact. You said, “Some people say”. Spokesperson: As I said, it sounds like you had the chance to ask Mr. Deng yesterday. Spokesperson: Any other questions? Yes, Khaled? A Permanent Five member of the Security Council told Inner City Press on the morning of October 28 that these “Deng book questions” were good. So while Deng as Special Adviser on the Prevention of Genocide may have refused to answer the question genocide and Sudan, maybe these questions about Deng and the UN will be answered. Watch this site. 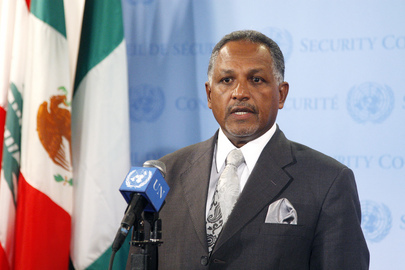 UNITED NATIONS, October 27 -- When the UN holds an event entitled “Sudan, a Vision for the Future” six weeks before the referendum on secession is slated to be held, it seems worth going to. There were piles of books for sale by the event's entrance in the UN's North Lawn building. UN official Francis Deng, charged with preventing genocide but rarely seen these days, was speaking about his writings, including “New Sudan in the Making” published, strangely, by Third World Book of Trenton, New Jersey and Asmara, Eritrea. The event was moderated by Kiyotaka Akasaka of the UN Department of Public Information, who intervened to cut short the response by Sudanese Ambassador Dafaala El Haj Ali Osman so that questions could be asked the audience, including those online. Inner City Press asked about the religious differences between South Sudan and the North, about how external debt might be divided, and the implications of a planned new oil pipeline to run south through Kenya. Only one of these questions was answered, and even then only by saying that debt is being negotiated in Addis Ababa, under the rubric of Liabilities. Afterward, Inner City Press asked Mr. Deng what other countries he and his UN Prevention of Genocide are working on, including what he might think of Secretary General Ban Ki-moon's panel of experts on accountability in Sri Lanka, which has not even asked to visit that country. Deng said “we don't like to single out countries” then said he was distracted due to an upcoming appointment. He was courteous as always and patrician -- of Abyei aristocracy -- but one wonders what is being accomplished. Sources say that under Deng, the UN Prevention of Genocide office is largely devoted to producing and promoting Deng's writings, including the time of other staff members of the Office. “Nice work if you can get it,” one insider commented, while noting that a less distracted person might be better for the UN's Prevention of Genocide post, unless it is by UN design a no-show job. Also appearing on the panel was UN peacekeeping's Team Leader of the Sudan Operational Team Jack Christofides, who afterward briefed a Permanent Five Security Council diplomat about the “logistics” of the Security Council's recent trip to Sudan. What is the UN accomplishing with all this book publishing and self- and Deng-promotion? As Deng concludes New Sudan in the Making?, “the question mark... is therefore pertinent.” Watch this site. Footnote: as to UN DPI and Mr. Akasaka, having debates with Q&A is generally a good thing. 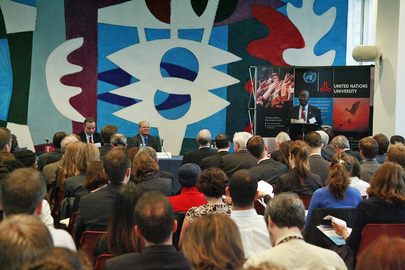 But it was alleged by a panelist after Tuesday's session that the purpose was to promote sales of a UN official's book. This should be clarified. Mr. Akasaka at the end mentioned possible future sessions on Haiti or Pakistan -- perhaps Jean Maurice Ripert could lead that session, since he is still being paid despite being relieved of his Pakistan envoy position. Could there be a book deal in the works?